Yesterday was the usual on the go type of day...seem to be having those a lot these days. Last night my oldest DD called me from her work and asked if a friend of hers could stay here a couple of days. I told her I would have to check with her dad, and I would get back to her. I checked...he said yes, (with a few rules) and so we are back to 4 kids. (We had a different friend of hers stay for a month in the fall). This friend is going through a difficult time...and just needs some space.....from her mom. Her dad is terminally ill, and the mom is having a difficult time (naturally) with it all. So, maybe a couple of days apart will do them some good. I feel sorry for all involved. I cross-stitched some last night while watching American Idol. I'm presently working on a small "Just Nan"...and have the perfect spot to hang it when finished and framed. I had my hair cut and highlighted a couple of weeks ago...and as much as I do not like photos of myself...I will leave you with a photo of my present hair style. I think I have my mojo back for blogging!!! I seemed to have taken a much needed break...more or less...random postings....not very interesting....but I do think I am BACK! Let me play a little catch up.....we have been busy around here......the kids always seem to be going somewhere! Here is my daughter...and our dog.....she was getting ready to go to a school event..
We've also been busy painting. We (DH and I) did the ceiling in the dining room/den, and I've been working on the walls. It's looking nice...we still have to finish the walls and put up the new moulding/trim...but I'm happy with it. And, very exciting for me....I had the opportunity to purchase some (okay, a lot!!) cross-stitch stash recently. I saw an ad posted in Kijiji (not sure if everyone has that...online for sale ads...local)....anyway, it really peeked my interest, but she was selling it as a lot, and I didn't want it all. After a couple of nice emails, the lady told me to come and look at it, and she would sell me what I wanted. It turns out that it belonged to her MIL. 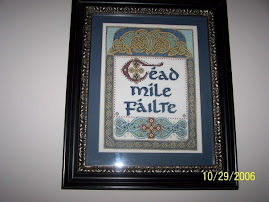 Her MIL started stitching at the age of 70 and was a perfectionist. I was amazed at what she had.....the designers were ones I had not heard of until I got online years ago, so I assume she was online as well...and we do not have an LNS near us.....she stitched on linen as well!! Turns out....she developed alzheimers eventually and kept buying, but could not stitch.....and now is in a nursing home. Her DIL told me that she knows her MIL would be thrilled if she knew her stitching went to someone that enjoyed stitching as much as me. Here is what I got:!! The above photo is a couple of designs that she had almost finished...I liked them, so I'll finish them off! I got....tons of beautiful linen...all serged on the edges....I got Bellpull hardware, Shepherd's Bush charts, Just Nan, Praire Schoooler, Antique Sampler charts and magazines....Elizabeth Designs, Sweet Nothings...etc...just to name some. The lady had taste!! AND, I got a box of embellishments.......however, most of the charts that required embellishments, had them kitted up with the chart. I also got all these frames....two are antique! To say I am thrilled is an understatement! I can't wait to stitch for my newly painted home!!! These are stitched...just need the "finishing"...and although you can't see it in the photos, the stockings are mostly beaded! Have a super great day everyone! I know you all like posts with lots of photos....this one isn't going to be like that. I've had all good intentions to take the photos and post regularly in the past two weeks...but that didn't happen. Life got in the way. I've been around...I've visited as many blogs as I can, I've popped into Facebook daily.....it's just been so busy here. DH and I are trying to paint our entire main floor, including the ceilings....and are doing it in our "spare" time. I've had my hair cut and highlighted, I've gone to the dentist (twice), my daughter has gone to the dentist, we have had Dr appts....you know the usual stuff that gets in the way of "fun stuff". It's been a busy couple of weeks. I just thought I would take this opportunity to update that I am still around.....I'm just trying to get so much done here. I've set a goal that I want all this painting and renovating done before my daughter's graduation party in June. What is done...looks great....so anyway, have a great day.....and yes, I'm still here. I have managed to stitch some....I will hopefully get some photos uploaded later today or tomorrow......and in the meantime...I am on my way out to get some last minute groceries for Easter....so I wish all my fellow bloggers....a HAPPY EASTER!!! !